You can find out more of the details and how to sign up at the 6 Days Website. Why did you decide to go to the Six Days in 2017? 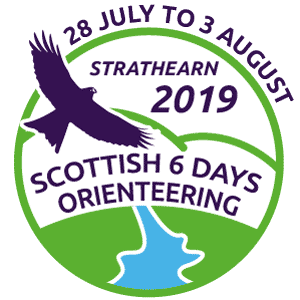 Orienteering every day for a week – who wouldn’t want to go! What’s it like going orienteering with so many people? At the Scottish 6 Days last time it was very busy with lots of people around all the time. This also meant that there were lots of places to get food and drinks as well as T-shirts and other equipment. There was an amazing ice-cream van last time and their ice-cream was excellent so we hope there’ll be the same again this time! You could get burgers, bacon and egg rolls, hot dogs and drinks at pretty much all the catering vans! The run-in was usually at the arena which was good because you could see everyone coming in to the finish from their courses. They had flags up from all the countries people were from which was lots. What’s the actual orienteering like? The courses themselves were a bit more difficult than the usual local event because the areas are much bigger and better at the event. There were the usual white, yellow, orange, light green and green courses as well as more competitive age classes for ages 10 up to 80+! There was sometimes a bit of a walk to the start and different courses started in different places so you had to make sure you went to the right place at the right time. We were given a starting time each day and you went to the start just before that and when they called your name you got ready to start. Because you had a time slot, you didn’t have to punch at the start but you did have to remember to punch all the rest of the controls. There were lots of people wearing different coloured tops from all the different orienteering clubs around the country. There was a 6 Days campsite in Ballater and there were local shops such as the co-op, some nice restaurants and good take-away shops. There were lots of tents, caravans and campervans in the campsite and lots of orienteers. Each day was organised by different Scottish clubs on a rota – I helped out with the string course on one of the days. Apparently someone from another club checks all the courses, to make sure they are OK and not too hard! What do you do when you aren’t orienteering? We enjoyed our week up in Deeside. One night we had a meal with the rest of ELO, another night we went to the ceilidh that was organised. It was good fun getting to know some of the other people in ELO and in some of the other clubs. Ah, watching those videos of the 2017 event is bringing it all back!